My daughter got an apron kit for her birthday a few weeks ago. 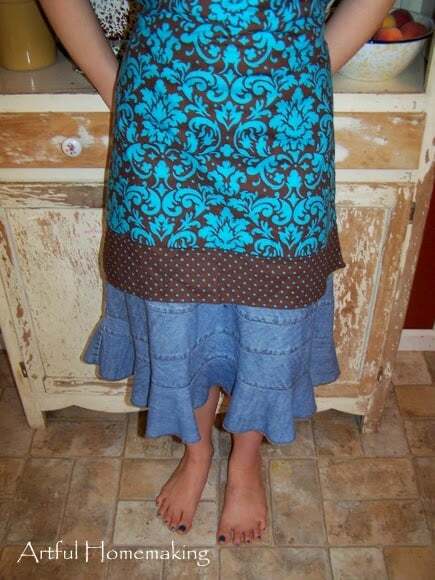 The apron pattern was printed right on the fabric, so all she had to do was cut the shapes out and sew it up. I thought it was a very clever idea for a beginning sewer, but the instructions were terrible! I was glad I was there to help her make sense of it all. We thought it turned out very cute. It's such a cute skirt! Thanks for your comment! Haha, I have that skirt, too. 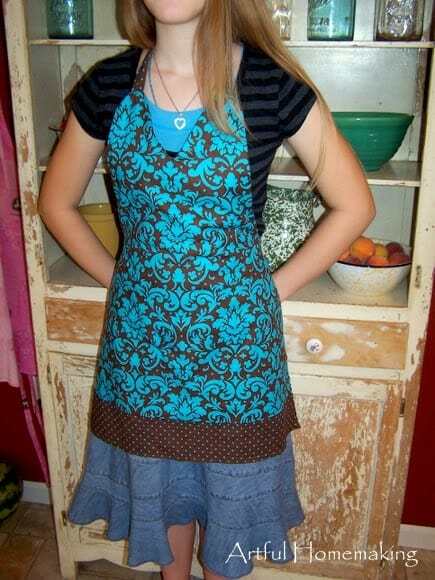 :) Cute apron! Thanks, Tanya! I've been thinking about you, too. I'll have to visit you soon! Love your new blog!! I've been thinking about you! I love your new blog! Keep up the great tutorials! 🙂 God bless! Just beautiful! She did a great job and I do like the matching blue toenails 😉 Thanks for the follow, I'm really enjoying your posts! Thank you, Sarah! I'll tell her you liked it. It turned out great! Well done Elyse! Also I love her skirt! Is it denim? I really like it! It turned out so nice. Great job, Elyse!